Set of four Liston amputation knives with ebony handles, dating from around 1850, England. These knives were used in surgical amputations of the mid-nineteenth century, they would be used to cut rapidly through soft tissue and muscle to prepare for the severing of the bone with a saw. 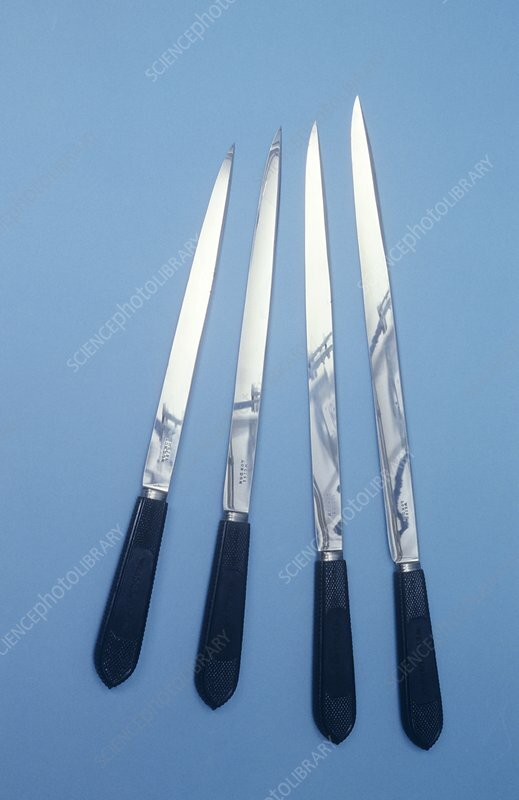 The knives take their name from Scottish surgeon, Robert Liston (1797-1847) who invented these double-edged blades to aid the precision and speed of amputation procedures. He became well-renowned for this style because in the pre-anaesthesia era, speed ensured minimal pain and higher survival rates for patients.